STANFORD, Calif. (AP)	-- Serena Williams looked completely out of sync for much of the match. Against a 15-year-old qualifier no less. Off her game and rattled by a teen 11 years younger, the top-seeded Williams rallied from one set down to beat hard-hitting Michelle Larcher de Brito of Portugal 4-6, 6-3, 6-2 on Wednesday night in the second round of the Bank of the West Classic. It was far from easy. So much for the expected quick rout by the No. 5 player in the world. "It's definitely encouraging to know I can bounce back. I haven't been down a set for a while," Williams said. "It's the kind of practice I need." Williams, playing her first match since losing the Wimbledon final to big sister Venus, committed eight unforced errors in the initial 12 points. She sprayed her typically reliable groundstrokes long and wide. She hit ball after ball into the bottom of the net and regularly missed first serves. Her father, Richard, briefly left his seat in a corner box after watching his daughter struggle so mightily. Larcher de Brito slipped and hit a backhand into the net on match point and Williams came around the net to shake hands moments later. "I actually thought about how I felt when I was playing a top seed," Williams said. "I felt I had nothing to lose and I probably played better than I would normally play." It was the gutsy Larcher de Brito -- who grunted loudly on every shot and pumped her fist on both her own winners and Williams' many mistakes alike -- was the aggressor until her experienced opponent with eight Grand Slam titles woke up in the second set. "I started off really well. I think I played pretty good throughout the whole match," Larcher de Brito said. "I kind of slowed down a little bit. I came through qualifying a little tired. She played a great game. She is Serena Williams. I didn't have much to lose. I pretty much gave it all. ... I don't think she really expected me to play that well. I had a lot of fun." Williams led 4-2 in the opening set before dropping six straight games to fall behind 2-0 in the second. She then changed rackets and rolled the rest of the way. In the fifth game of the middle set, Williams hollered, "Come on!" to get herself fired up after smacking a backhand winner down the line. On the difficulty of returning the teen's serve, Williams said, "I couldn't get my feet to register with my brain." "I think if she plays the way she did against me, she'll be a great player," Williams said. The 26-year-old Williams is playing in her first Bank of the West event after being scheduled to appear three other times only to withdraw. She did play at Stanford in the 1999 Fed Cup final against Russia. 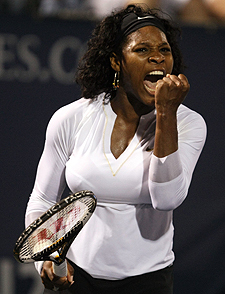 Williams is looking for her fourth tournament title of 2008 and 32nd of her career. She will play in the quarterfinals Friday against the winner of Thursday's second-round match between Russia's Alisa Kleybanova and fifth-seeded Patty Schnyder of Switzerland. Larcher de Brito, meanwhile, had advanced to the second round by beating Argentina's Gisela Dulko 7-5, 7-6 (1) on Tuesday. That's after she won three qualifying matches to reach the main draw. "It was almost an upset but I still have a lot of years ahead of me and a lot of experience to gain, a lot of tennis to play," said Larcher de Brito, who hopes to get into the U.S. Open though is currently an alternate. "She just has all the power, all the experience. She's been there for many years now. I'm just coming [up] now and hopefully I'll do well." Venus Williams is not playing in this event at Stanford. Earlier Wednesday, Ai Sugiyama ousted fourth-seeded Daniela Hantuchova of Slovakia 6-3, 6-1 to advance to the quarterfinals. The unseeded Sugiyama, from Japan, fell behind 3-0 in the first set then won the next nine games before Hantuchova held serve to make it 3-1 in the second set. Sugiyama needed three sets to beat wild-card entry Alexa Glatch in the first round. Hantuchova has been dealing with a stress fracture in her right heel since May and Wimbledon was her first tournament since April. She lost in the second round of Wimbledon to Kleybanova. Sugiyama will face Slovakia's Dominika Cibulkova, a 6-2, 6-3 second-round winner over Katerina Bondarenko of the Ukraine on Wednesday. Second-seeded Anna Chakvetadze of Russia beat Shahar Peer of Israel 6-3, 6-4. Chakvetadze lost the first game of each set and trailed 4-3 in the second before winning the final three games. She will play the winner of Thursday's second-round match between No. 6 Marion Bartoli of France and England's Anne Keothavong.